Palo Alto Low Chair in the background. Like many makers of fine studio furniture, Jared Rusten loves the look of Arts & Crafts era and traditional Japanese chairs and cabinets. "So my [early] work was joinery heavy, and technique was on display," he says. "After a few years I got tired of that." Rusten, a San Francisco woodworker who will debut new pieces at the West Edge Design Fair October 3 to 6 in Los Angeles, has instead gone in for what he calls "handwrought modernism." "I could quiet down some of the joinery," says Rusten. "It would still be traditional wood joinery but not in your face. I would focus on the silhouette of the form and the wood, showcasing the material, but in a way that would be modern, with clean forms that didn't distract too much." Rusten credits the pioneering modern designers Alvar Aalto, Corbusier, and Mies van der Rohe, and the Apple aesthetic, as influences. "My Palo Alto [Low] Chair has obvious Mies references, with the cantilevered seat," he says. "Traditional studio furniture can often be too fussy," Rusten says, "with lots of surface decoration, carving—or it can be a little too representational or referential of something, or too crazy with curves or bent pieces." Rusten, who creates 20 to 30 pieces a year, hopes to get that number up to 50. "I definitely like to keep it small," he says. Some woodworkers, Rusten says, focus on furniture as art, some as furniture that is functional. Some focus on the beauty of the material, others on fine proportions. "I hope I can contribute to the design language by creating a harmony between these things," he says. Working in a studio in the City's Mission district—not a "factory," he notes—Rusten handcrafts cabinets, desks, tables, and office and residential interiors—but preferably chairs. A few interns assist. "Chairs are what I feel most satisfied with," he says. 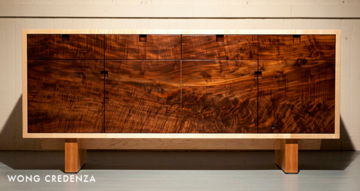 "With cabinets or tables, you're pretty much just engaging with this one, flat plane. It's kind of limited. 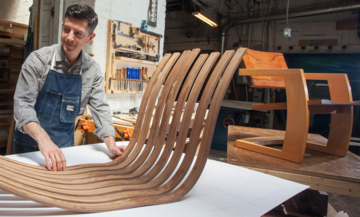 With a chair, you're making these three-dimensional objects, and if you're successful in its design, it's going to look good from every angle, no matter where it's positioned." "A chair is just an intimate object," Rusten adds. "It literally surrounds your body. It literally supports you." Rusten aims at comfort, noting one of his goals. "I'm five-foot-six and I have a friend who's six-foot-eight. If I could create a chair that felt good to me and felt good to him, I'd arrived." Raised in San Jose, Rusten, who built skateboard ramps as a boy, chose woodworking as his career in 2001, studying in the Los Angeles area. He opened J. Rusten Furniture Studio in 2003. 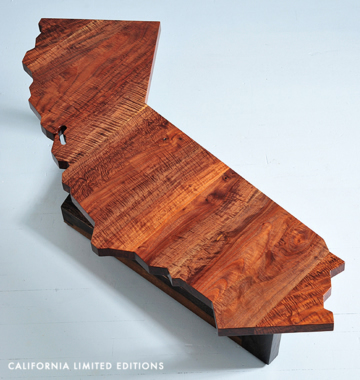 It didn't take long to get on the map—thanks to the California series of tables and desks shaped like a map of the state. Yes, the design is "representational," but it sure catches the eye, and the attention of the press. Among many appearances, the California table has been on the cover of a San Francisco magazine in the embrace of a comely model. "In a way it's sort of a gimmick or a trick," he says of the California series, adding, "You see the shape. That draws you in. Then you look and you can see the wood, the beautiful grain of California walnut." 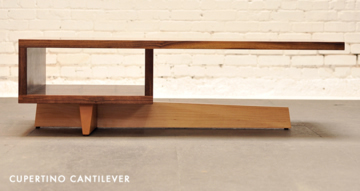 To see more of Jared Rusten's woodwork, click here. For more on the West Edge Design Fair, click here. Were Anshen & Allen Inspired by Wright? This website and its entire contents is copyright © Eichler Network 2018. All rights reserved. Redistribution or reproduction of any photographs, text, or other contents without the expressed written permission of the Eichler Network is prohibited.